Mid-May report includes information about Detroit River walleye and white bass, Lake St. Clair largemouth and smallmouth bass, bass fishing in Traverse City and inland lakes, lake trout at Elk Rapids, and river fishing options, including Tippy Dam. May’s warmer weather has life feeling much more in balance than when compared to April’s chill. Sunny days warm the waters from top to bottom, and this in turn, has fish more active. All of the fish seasons are now open, and anglers can enjoy the nicer weather to get out and target their favorite species. There are, however, a few changes that anglers in the Frankfort, Traverse City, and Elk Rapids areas should know. The daily lake trout limit has been reduced from three fish down to two fish, with the slot size also changing. Anglers may keep lakers between 15″ and 27″, with one fish over 34″ allowed per angler. 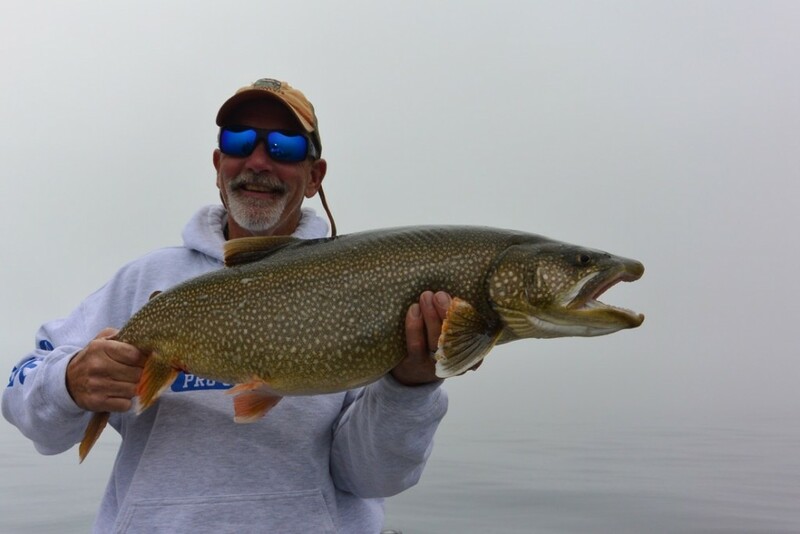 Grand Traverse Bays have some very cold water, but the lake trout and whitefish are active and biting. The fish are still mostly deep, at this time, so anglers should begin looking for these tasty fish in 120-150 feet. Towards the end of the month, fish may roam much shallower, coming in towards 80 feet and sometimes even as shallow as 50. Jigging baits like the BBM Squirrel Jig, Jonah Jigs, or Elk Rapids jigs can all produce well. Play with different sizes and jigging actions to see what fish want on any given day-some days they want large heavy options, and other days, they want more of a finesse down-sized jig. It’s not uncommon to see small groups or single lake trout cruising the shallows on Grand Traverse Bays. Bass baits can tempt these cruisers into biters, and in shallow water, they are a hoot to catch. Platte Bay is full of life right now, with lake trout, brown trout, smallmouth bass, and late steelhead all being caught on any given day. With water temperatures cooler than the normal because of the extreme cold and ice this past winter, fish that normally might have pulled back out to deeper waters are still relatively shallow. Casting minnow baits can be an excellent choice for both smallmouths and brown trout. The Platte River will still have some steelhead in it, with fish dropping back to Lake Michigan as the month progresses. The walleyes that were in the Platte River in April have now moved back out to the lake, but some may still be shallow around the reef separating West from East Platte Bay. Inland lakes in May are phenomenal fisheries in their own right, and species like walleye, pike, panfish and, of course, the hard-fighting smallmouth bass are all viable targets this month. Jerkbaits, vibrating blade baits and spinnerbaits can be great options for pike and bass. Jigs tipped with minnows, and slowly-trolled crankbaits can land walleyes as well as bass and the occasional pike. Weedlines, deep drop-offs and points are all areas worth spending some time on. May is one of the favorite times of year for most of the Sport Fish Michigan Captains and Guides. Waters are warming, but still be cautious and stay safe out on the water. And make sure that you remember to put the drain plug in when you launch!